In 1972, young Kevin Naughton and Craig Peterson took to the road with surfboards, camera gear and an untamable desire for adventure. For ten years they scoured the planet in search of perfect waves and experiences only a traveler on the road encounters. This documentary film chronicles their journey. In the 1970s Kevin Naughton and Craig Peterson wrote a series of travel articles for Surfer Magazine, documenting their incredible ten-year journey around the globe. The film The Far Shore is a cinematic journey inspired by those same articles. A fusion of stills, super 8 film, live interviews and the articles themselves blend together to make this a multi-layered film experience. For those who remember reading their articles in the '70s to those just beginning their surfing lives, The Far Shore is an education. 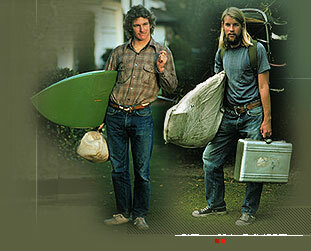 A historical document of surf culture and a deep look into two of surfings great personalities. The late '60s and early '70s in California were a time of considerable political upheaval. People were taking all kinds of avenues to explore what that might mean for themselves. Kevin and Craig are part of a surfing subculture, which opted out of some of the obvious choices (drugs, religion) and instead took to the road of exploration. One of the things that my film attempts to do is to investigate and to come to understand that the surfing culture is not singular, and that people in it dont conform to a stereotype. Just as the Beats were considered "one" type of person, but in fact were extremely varied and diverse in their approach and beliefs. You can think of Kevin and Craig as surfing ethnographers by their travels and explorations into various cultures around the world. Theres a dimension to Craig and Kevins photography that has a soulful, color-blazon quality thats like a lot of 70s psychedelic work. With the advent of low cost cameras like the Super 8, both ethnographers as professionals and individuals like Kevin and Craig specifically, found themselves able to document cultures visually in ways that people were not able to do so before. It seems to me that Kevin and Craig were part of a larger effort to make a visible record of what their encounters with cultures not their own was like. The Far Shore is as much an ethnographic documentary as it is a surfing movie. So 31-year-old Topanga surfer Greg Schell is up in the graduate film program at San Francisco State University, angst-ing over a subject for his final project when he flashes on how much he has enjoyed the Kevin Naughton and Craig Peterson travel series in 70s-era Surfer mag. Boom. Calls Craig, arranges a meeting, and the three get together to feel things out. Next thing you know, Schells on the plane to San Salvador to see if he can pass muster with surfings most endearing grass roots surf travelers (see TSJ 10.5s Passing Time in El Salvador). Turns out they dig the guy, and Craig mentions that oh, yeah, they have hours and hours of Super 8 film that Kevin shot on their journeys. Thats right  The Far Shore takes you around the horn to all of the destinations Naughton and Peterson scored in the early 70s, and Craigs still camera work comes to life in beautiful ways in the moving picture medium. Adding to the package are Schells well-paced interviews with the two, contextualized for the non-surfers among us by UCSC sociology prof Bill Nichols. The personalities of Kevin and Craig make the film: Kevins dry wit and comic timing are the perfect counterpoint for Petersons guileless, matter-of-fact storytelling. Its easy to see how these two traveled so (apparently) effortlessly together. While Shore is filled with surprises  like learning that a teenaged Peterson worked for a period on an oil rig supply boat in the pirate-infested waters off the Congo  it is the seamless totality of the project that make it a cant miss. Music, discovery, stills, and surfing fuse to make this the most pleasant surf media surprise Ive had in years. an insufferable heat made our clothes feel like burlap, and no nearby abundant supply of fresh water meant a bath was out of the question." "Edging over the feathering crest of the first wave, already past vertical, I caught a glimpse of what seemed like an infinite number of swells stretching to the horizon."